Radiant Panels are an elegant alternative solution to traditional wall mounted radiators, convection heaters and air conditioning systems. Sargasso radiant panels are available in two designs and provide heating solutions for a wide range of applications including, offices, schools, healthcare and leisure. 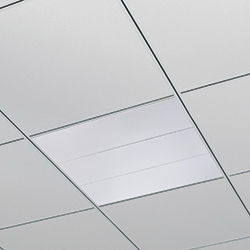 Suitable for use in both Standard T-Grid and Micro T system ceilings. Material: 2mm high-grade aluminium extrusion, lightweight, robust, optimum response time. Finish: RAL 9016 white powder coat. Insulation: Rigid non-fibrous, foil-faced insulation to EN13165 fire rating A2. Material: Smooth faced panel manufactured from 1.2/2.0mm aluminium with panel edges returned for containment of insulation and increased panel rigidity. Pipe carrier manufactured from aluminium bonded to the panel under heat and pressure to ensure integrity of contact along the length of the panel. Finish: Polyester Powder coated supplied as standard with a RAL 9010 smooth finish with 20% gloss level; anti-bacterial coating and other colours are available. An anti-bacterial paint finish inhibiting the growth of micro- organisms is available, providing additional assistance in meeting infection control targets. Insulation: 30mm mineral wool pad sealed in tissue paper with foil face. Suitable for use in Micro T system and standard T-Grid system ceilings. Please note that Sargasso is compatible with regular ceiling profiles, but not compatible with Tegular or Microlook ceilings. Suitable for installation from drop rods (not supplied). Panels longer than 1200mm will require 3 fixing locations.